In the age of Facebook, Twitter, LinkedIn, and other global social networking tools, networks, and ways in which we can (re)construct and analyze them, have become an important focus of research across the disciplines. This is no less true for those of us studying the premodern world, where networks (whether social, political, familial or intellectual) were both the fabric and the driving force of societies. 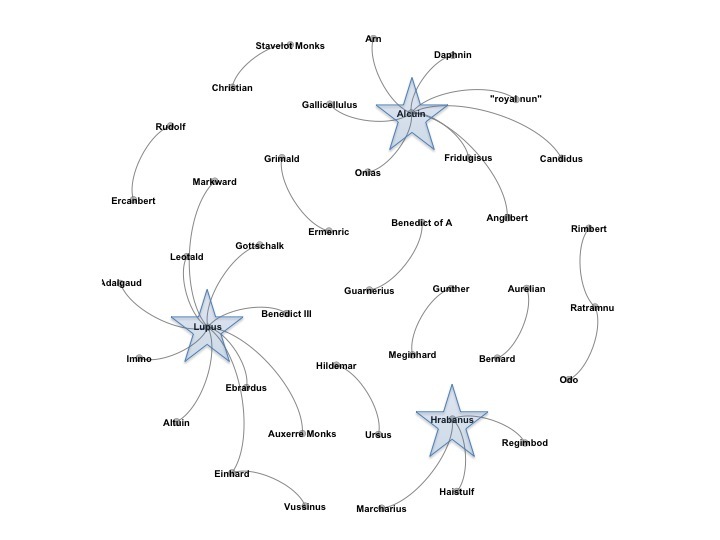 This post draws on material from my ongoing Carolingian Intellectual Networks project, the broad aim of which is to collect data on and map all the various connections between scholars, teachers and students in the late eighth through ninth centuries. The intellectuals I am studying were located across a large area of Europe comprising what is now France, the Low Countries, Switzerland, western parts of Germany and Austria, and northern Italy. This vast geographical area constituted the Carolingian Empire, a territory united by the military campaigns of Charlemagne in the later eighth century, and holding together, more or less, through the reigns of his successors until the late ninth century. This early medieval period–from about the 770s to the later ninth century–is usually referred to as the Carolingian Renaissance. As the term “Renaissance” might suggest, the period was distinguished by its rich and sophisticated literary culture. Modern scholars have long been interested in Carolingian intellectuals and in the centres that housed them, usually monasteries or cathedrals, or the courts of aristocrats and kings. To date, studies have tended to focus on individual scholars or individual schools, and typically on the very small number of individuals or centres for which we have the most data. Crucially, these studies are text-based. Maps and diagrams might be used to illustrate or clarify a point, but rarely work to enhance data and provoke further discovery. 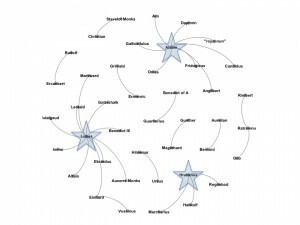 This post interrogates two recent (and representative) text-based studies of early medieval scholars and intellectual networks. Through visualizing data captured from these studies, I explore the challenges encountered in reconstructing early medieval intellectual networks and demonstrate the limitations of text-based network analyses. As we shall see, these are of necessity selective, offering in consequence only partial or fractured glimpses of the whole. If we are to reconstruct a total intellectual network in all its complexity, we need to start exploring the possibilities offered by new digital tools, preferably tools that allow for dynamic visualizations of our data. In addition, I hope that this post demonstrates the power of the visualization process itself, a process that enables–even requires–us to ask different and larger questions of our data. What we know about Carolingian intellectuals we know because they wrote–to each other, for each other, occasionally about themselves. Quite possibly the richest source of information about Carolingian intellectuals–their interactions, connections, and networks–are the collections of letters that survive from the period. The two studies I have chosen to interrogate in this post use letters as their primary source for establishing and discussing connections between Carolingian intellectuals. The first study is an article by John J. Contreni entitled “The Carolingian School: Letters from the Classroom”. While Contreni did not explicitly set out to reconstruct an intellectual network, his piece is useful for our purposes because of the wide selection of scholars featured in it. From the intellectual scene Contreni sketches, networks emerge. Diagram 1, constructed using Wordle, serves to introduce the more than forty individuals whose connections are discussed in Contreni’s paper. By counting the number of times each individual’s name occurs in Contreni’s text, I was able to produce a word cloud that provides a sense of the relative influence and importance of each intellectual, at least for Contreni. This representation of Contreni’s “network” gives an impression of the size of the scholarly crowd, but is most useful for identifying those individuals within it that loom largest in his study: Lupus, Ermenric, Alcuin, Hrabanus, and John Scottus. Alcuin (†804), an Anglo-Saxon cleric, and one of the most famous and important scholars and teachers of the Carolingian age. He became an adviser to Charlemagne, a teacher at his court, and later abbot of the monastery of Tours. Hrabanus (c.780-856), a monk at, and then abbot of the monastery of Fulda on the eastern edge of the Carolingian Empire. He was later elected to the archbishopric of Mainz. These three men are, to medievalists, the “usual suspects” when we talk about scholarship and education in the Carolingian Renaissance. Their prominence in the Wordle diagram of Contreni’s article is not surprising. Diagram 2, created using Gephi, an open-source visualization platform, better illustrates emergent networks in Contreni’s piece. 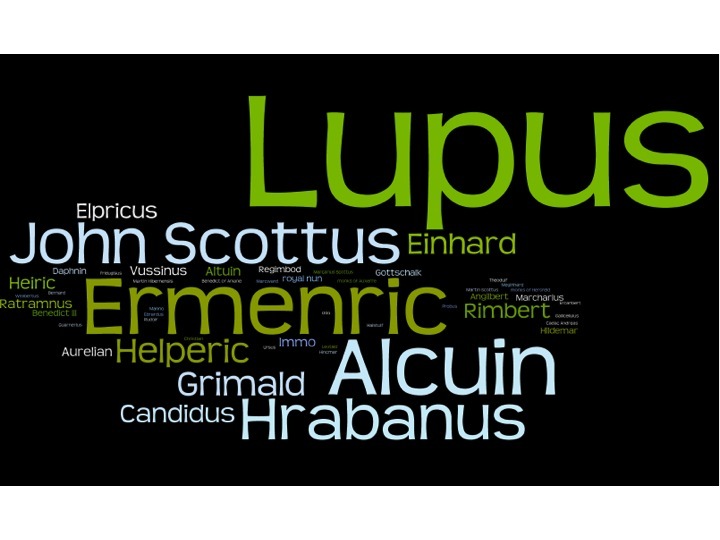 It shows more clearly how Lupus, Alcuin and Hrabanus achieved their prominence in the word cloud. Diagram 2 is based purely on the letters used by Contreni to explore relationships between scholars. Each edge in the diagram represents a letter. Visualizing Contreni’s data in this way is interesting because it suggests relative sizes of network: Lupus enjoys the largest, then Alcuin, then Hrabanus. It is also striking that these three scholars and their networks appear not to intersect with each other, or with anyone else featured in the diagram. 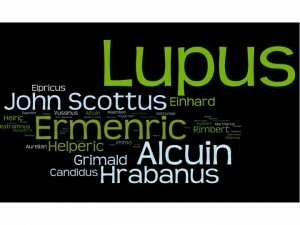 A curious result because, as every historian of the early middle ages–and certainly Contreni–knows, Alcuin taught Hrabanus who in turn taught Lupus, yet these particular connections aren’t evidenced in the letters selected by Contreni for his article. Instead, when we visualize Contreni’s data, separate egocentric networks emerge around each letter writer. This, I would argue, is typical of the way historians tend to approach early medieval networks. The reality is far more complex. I will return to the problem of selectivity in text-based network studies later. First, let us consider two important factors that tend to get taken for granted, downplayed, or even overlooked in network studies: the location of the individuals in question, and the dates when they were active.